One of famed investor Warren Buffett's favorite stock-market aphorisms is that traders should be "fearful when others are greedy, and greedy when others are fearful." 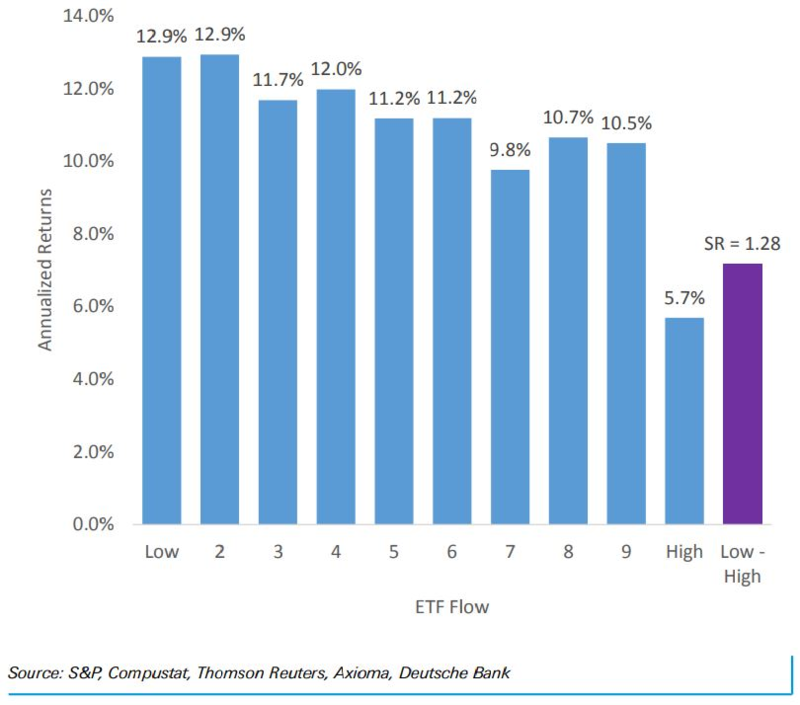 The investment bank conducted a study examining how exchange-traded funds performed following periods of high inflows or outflows. While flow data can be messy - not only are they extremely volatile for the largest funds, but inflows can mean an investor is building a short position, which means he or she is betting the fund will decline in price - the results were dramatic. A portfolio that bought exchange-traded funds with substantial outflows saw significantly higher gains than one that moved with the herd - buying funds with heavy inflows. According to the firm, "$1 invested in those firms with the most negative ETF flow in January 2006 grows to $3.48 at the end of December 2017, compared to $1.40 for those firms with the highest ETF flow." 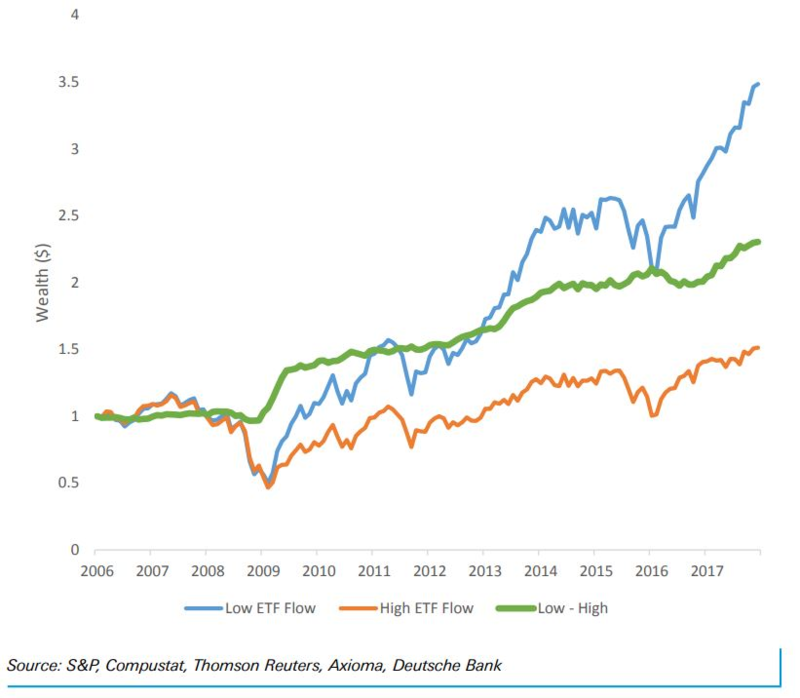 As seen in the following chart, the outperformance of the high-outflow portfolio picked up dramatically in early 2009, when the stock market put in a bottom in the wake of the 2007-09 financial crisis. That moment - which saw the S&P 500 tumble to a 12-year low - was the point investors felt the most pessimistic about equities, no doubt prompting many to cut their stockholdings. However, early 2009 also marked the start of the still-ongoing bull market, a rally that has seen stocks more than quadruple. ETFs are essentially mutual funds that trade intraday on an exchange, like stocks. While there are funds that track essentially every major asset class - including every significant index for stocks, bonds, and commodities - equity funds are by far the most popular. According to FactSet, U.S.-listed stock ETFs have $2.88 trillion in assets, compared with the $622.6 billion held in fixed-income ETFs. 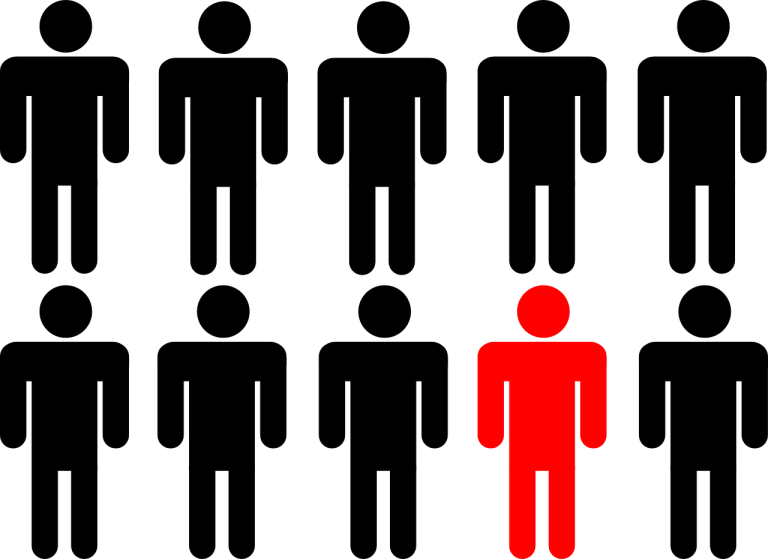 The ETF industry has been growing for years as investors move to them from mutual funds - which are seen as less flexible and tax efficient investment vehicles - as well as from actively managed strategies to passive ones. That has provided a steady underpinning to flows. So far this year, stock funds have seen inflows of $79.7 billion, while $55.2 billion has flowed into bond funds. However, flows were negative in June, the third month of outflows thus far this year - which already represents the greatest number of monthly outflows since 2009. Someone using Deutsche Bank's strategy would have benefited from that trend, as stocks have risen sharply thus far in July. The S&P is up 3.8% thus far this month, while the Dow Jones Industrial Average has gained 4%. The Nasdaq Composite Index is up 4.4%.